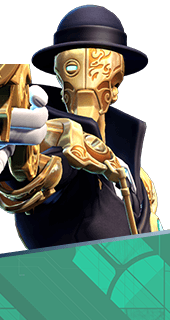 Bindlebane is an Ability of Marquis in Battleborn. Marquis' signature collapsible sniper rifle, fit with a custom hilt pistol for close-range engagement. Heavily augmentable. Increases Bindlebane's magazine size. +2 Clip Size. Increases Bindlebane's base damage. +18% Damage.